Try a winter classic in a new way: sweet potatoes sweetened with brown sugar, cinnamon, and nutmeg, then twice baked in potato halves. I didn’t start to give sweet potatoes the respect they deserve until I was well into my twenties, but I’ve been doing my part make up for lost time. I’m always down for trying a new sweet potato recipe, and I especially love new twists on classic favorites. And, you guys, these twice baked candied sweet potatoes are exactly that. They take everything that’s good about candied sweet potatoes (the sugar, the spices, the marshmallows) and serve it in the built-in bowl that is a halved sweet potato. 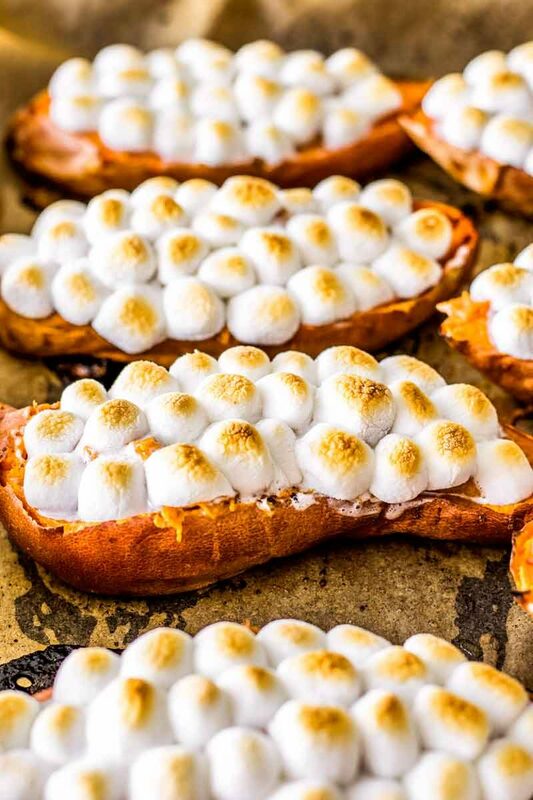 Plus, these twice baked sweet potatoes make great individual-sized side dishes. No need to worry about serving; everyone can just grab a half! Yes, these sweet potatoes can be made in advance! Follow the recipe instructions like normal, but stop just before baking the potatoes a second time. Store the potatoes in a sealed container for up to two to three days. When ready to bake, pick up from where you left off in the recipe instructions, but increase cook time by about five minutes. Can twice baked sweet potatoes be frozen? Yes, they totally can! Potatoes are great for freezing and these candied sweet potatoes are no exception. Follow the recipe instructions like normal, but stop just before baking the potatoes a second time. Place the prepared potatoes on a baking tray and freeze for about two hours. Once frozen, individually wrap the potatoes (use whatever you like most – foil, plastic wrap, or just plastic bags) and store in the freezer. Frozen sweet potatoes can last for up to 12 months. When ready to bake, place the frozen sweet potato halves on a baking sheet. Pick up where you left off in the recipe instructions, but increase the bake time from 10 minutes to 20-30 minutes. Then set the oven to broil and toast the marshmallows as instructed. For this recipe, I used orange-flesh sweet potatoes, which are sometimes labeled “yams” in American grocery stores. 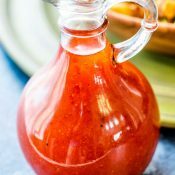 However, you can use any variety of sweet potato or yam that you’d like or prefer for this recipe. If you’re curious about the different types and labels for these veggies, check out this article: What’s the difference between yams and sweet potatoes? Coat sweet potatoes in olive oil and pierce skins numerous times with a fork. Place sweet potatoes on a baking sheet lined with parchment paper. Bake sweet potatoes for 1 hour and 10 minutes. Allow sweet potatoes to cool for 10 minutes. Cut sweet potatoes in half. Using a spoon or a cookie scoop, remove the inside of the sweet potatoes, being careful to leave a 1/4 to 1/2 inch ring around the sides so that the potatoes keep their shape. Place sweet potato pulp in a large mixing large bowl. Set the halved and emptied sweet potatoes back on the baking sheet. Add brown sugar, melted butter, sweetened condensed milk, cinnamon, nutmeg, and ginger in the bowl with the sweet potato pulp. Using a hand mixer, blend ingredients together and smooth. Spoon blended sweet potato mix back into the sweet potato halves, filling each a little past full. Place potato skins back in the oven and heat for 10-15 minutes, then remove from oven. Stick marshmallows in the soft sweet potato mix, completely covering it. 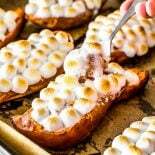 Place filled sweet potatoes back in the oven on the top rack until marshmallows melt and lightly brown, about 1-2 minutes. Since each oven is different, keep a close eye on the marshmallows so they don't burn. If they do burn, you can use two spoons to remove the marshmallows (they should come right up in a solid piece) then repeat the steps of placing the marshmallows on the sweet potatoes and lightly browning them in the oven. Serve twice baked sweet potatoes immediately. These are straight up GORGEOUS! What an amazing side dish for Thanksgiving!Pinned! Mmm, those look so good. Candied Sweet Potatoes or Candied Yams are some of my favorite dishes at Thanksgiving. Yum! I love sweet potatoes but most of my family doesn’t so we don’t often have them. I think I’ll need to make these regardless! 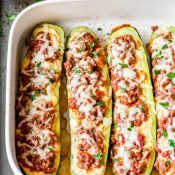 These look gorgeous and sound delicious!! Thanks for sharing your recipe! I never thought of doing this on sweet potato halves! Seems easier than peeling and doing the whole casserole! Thanks for sharing this. 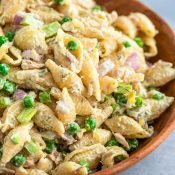 I will be making this recipe a lot! I can’t even wrap my head around how amazing these look! You’ve nailed all of the delicious elements of candied yams for sure! 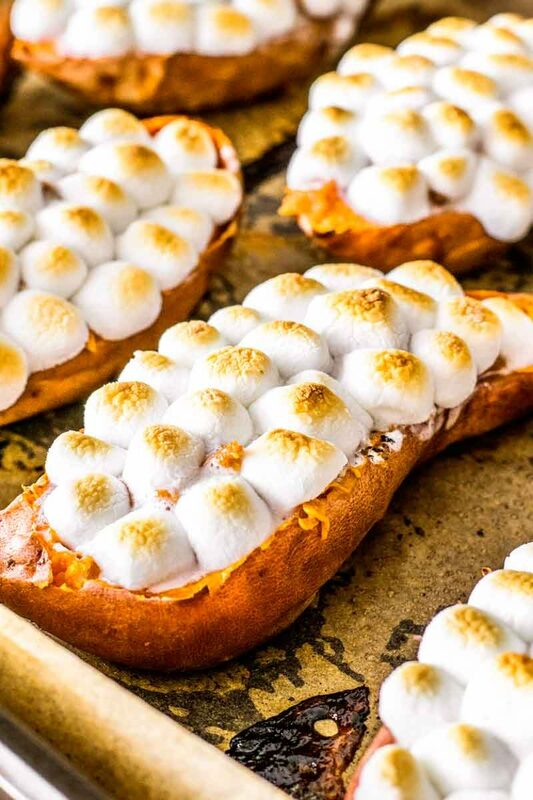 Such a fun and creative twist on candied yams. Love that toasted marshmallow topping. Sweet potatoes are definitely one of my favorite sides at the Thanksgiving table. Have been since I was a kid! That looks sooooo good. Why don’t we have food like this in Australia?? These look absolutely Devine. My wife always made a sweet potato casserole during the holiday season. One year when our son and daughter-in-law were over, my daughter-in-law turned her nose up and refused to eat any. My wife flatly explained to her that she, my wife, had a rule. You either at least try a taste of everything or you ate nothing. When she got through tasting, there almost wasn’t enough to serve at the table. True story. Thank you so much for writing in, Raven! I’m so glad you liked it 😀 Hope the family does, too! 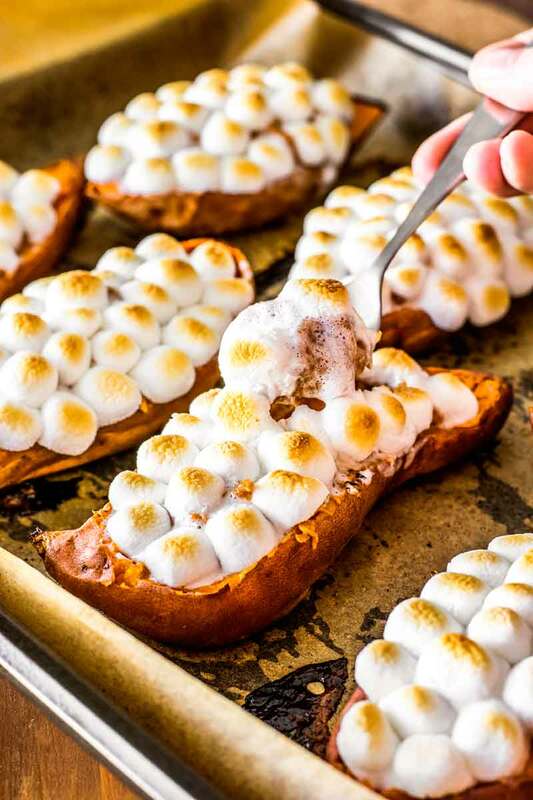 I’ve never ever tried marshmallows on my sweet potatoes before. I’ve heard such good things about it though, so I definitely will have to try it out! Is it possible to do these the day before and reheat and then broil the marshmallows just before serving? Hey, Dee! For the sweet potatoes, how much are you scooping out of the middle? In order for the potato to keep its shape, you have to leave about 1/4 to 1/2 inch of potato “flesh” around the edges/skin so it’ll still hold a bowl shape. If you scoop out too much, the potato can’t hold its form anymore and will flatten. It can be a little tricky, but the best I can suggest is to start scooping out from the middle and slowly work your way to the sides. Check the potato often (picking it up, touching the sides, etc) and the moment it starts to bow out too far or the sides appear to get flimsy, stop scooping. You can even out the corners to get a bit more potato, but overall, if you scoop slowly it’ll give you a good idea of how much is “too much” to scoop out and when to stop so you can get the pretty presentation.